David Ray Griffin: Review of "September 11 - The New Pearl Harbor"
Review of "September 11 - The New Pearl Harbor". A documentary by Massimo Mazzucco. 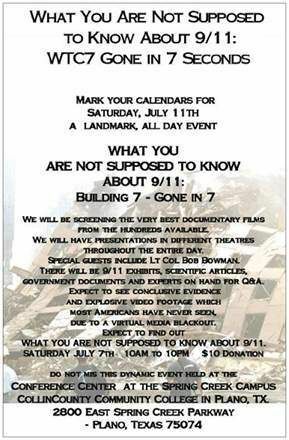 Mark your calendars for Saturday, July 11th for a landmark, all day event entitled “WHAT YOU ARE NOT SUPPOSED TO KNOW ABOUT 9/11: Building 7 - Gone in 7”. http://www.711911.webs.com/ A vast array of the very best documentary films will be screened in different theatres throughout the entire day. There will be 9/11 exhibits, special guest presentations, scientific articles, government documents, and experts on hand for Q&A. All of the following videos are listed on my Canada Wants 9/11 Truth site, but we not post here as well? So far, I've been able to collect over 50 videos dealing with the truth behind the attacks on 9/11. If anyone knows of any that I missed, please point the way. I love watching this collection of videos grow. A look inside the attacks on 9/11 by Eric Hufschmid. Is the U.S. Government capable of conducting an unbiased investigation into the 9-11 attacks? In this short documentary-style video, I outline the mathematics and science of WTC7 as it relates to its uniform 6.5 second collapse at 5:20 pm on the evening of September 11th. I also briefly touch upon the government analyses conducted by FEMA and NIST, and I compare the collapse to known controlled demolitions and similar steel structures with fire and/or structural damage. Additional info that the viewer may find applicable is that more than half of the diesel fuel was recovered by the two largest underground storage tanks post-collapse (documented by FEMA), and that fires on the north, west, and east sides of the building did not appear to be out of control. In the intro to the vid, the BBC field reporter mysteriously digitizes out of the conversation minutes before WTC7's collapse, after having prematurely reported its collapse 20 minutes before it occured (with the building standing behind the field reporter in plain sight). Also interesting to note, if the hypothesis of NIST is true, then controlled demolition crews only have to weaken one core column in a skyscraper to perfectly implode it. This is a nice tool for all you truthers out there hitting the streets with info for the masses. I thank the DC group for the inspiration. Here's the 2nd version of our Cleveland 9/11 Truth compilation. It's an .iso dvd-5 image (single layer). To download here is the link to download the torrent. The text below is extracted from an email. The venue is The Democracy Center (map). An evidence-based, scientifically-sound look into what really happened on 9/11. 26 hours of spellbinding documentaries about 9/11 and related topics. I know it is late notice, but I am putting Improbable Collapse on public access in New York City (Manhattan, to be exact). A 58 minute, edited version of Michael Berger's Improbable Collapse will be showing on Manhattan's Cable Public Access TV (Manhattan Neighborhood Network). Following are the times and dates, whicn can be confirmed 7 days before the date of airing on the Manhattan Neighborhood Network website. I found out my air times from the director of programming. In this the 2nd of a 3 or 4 part series on the 9-11 Dust, Visibility 9-11 welcomes to the program Penny Little, producer of the new 9-11 documentary, 911 Dust and Deceit. One week after September 11th, Christie Todd Whitman stated that, "Given the scope of the tragedy from last week, I am glad to reassure the people of New York and Washington D.C., that their air is safe to breathe and their water is safe to drink. ", even as the EPA had information to the contrary. In fact, the 9-11 dust was extremely caustic and in August of 2003, the EPA issued a report showing the changes the Bush administration made to the intial cautionary statements which were originally meant to warn the public of the dangers in the dust. These warnings were changed to reasurances and the public never heard the truth. These lies have resulted in thousands of people getting sick from breathing the toxic dust, and now, over 5 years later, they are dying. If you think our own government isn't capable of deliberately killing its' own citizens, think again.